So the appe pan fever did hit me too. Have lately seen many recipe’s in appe pan, and I really loved the idea. 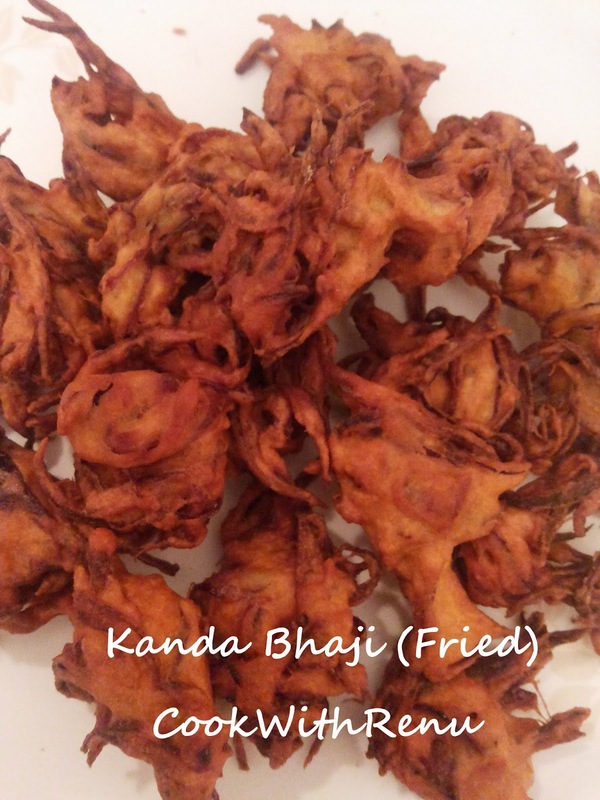 Instead of deep frying it is a good healthy option with minimal oil. Obviously the taste of deep fried snacks or food cannot be beaten but then everyone knows the hazards of eating too much deep fried. So I have given this a go and I liked it. 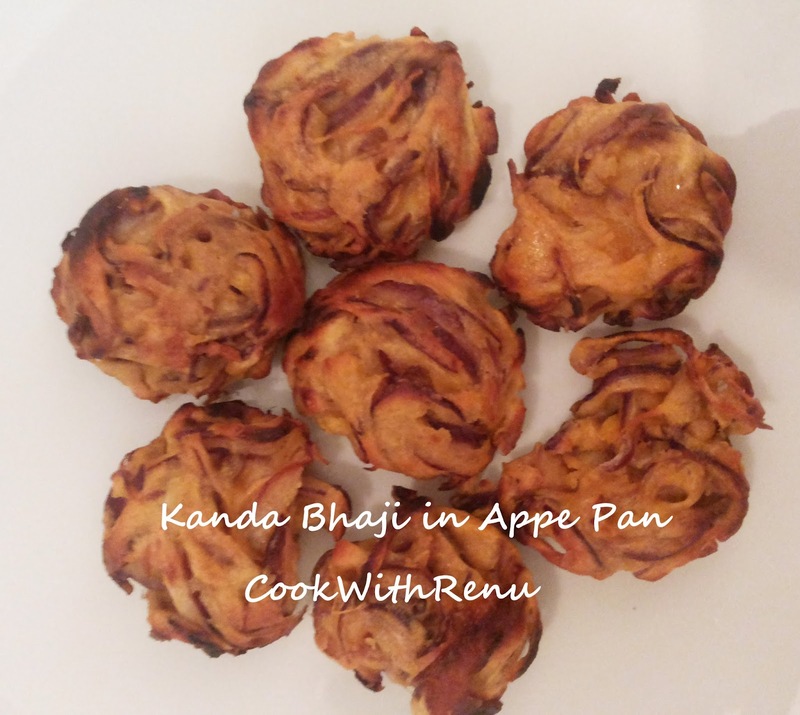 So I first tried it with this simple and easy Onion Bhajiya/Pakoda/Fritters, Kanda Bhaji and it came out really well. It takes time and patience to cook in appe pan. I also loved the shape of it. I have below given the procedure for both Deep fried and the appe pan one. Thinly slice the onion lengthwise and mix it with all the ingredients, i.e. Red chili, Green Chili, Haldi, Besan and salt. Coat the onions well with the mixture and leave it aside for at-least half an hour (30 minutes). Do not add water. The onions will release the water when mixed with salt and flour. Not adding the water makes it really nice and crunchy and similar to the ones we get in roadside stalls. Heat the appe pan on medium heat. Once hot coat it with oil, or add a drop of oil in each appe. I simply use a silicone brush to do so, it helps in coating it evenly and uses less oil. Make small balls or rounds of the mixture and add it in each appe. Let it cook on slow to medium gas on one side. Once golden brown turn it and cook it on the other side. One can drizzle very little oil (or drop of oil) from the sides. In appe pan, one needs to keep turning it and let it cook on all sides. Once it is golden brown on all sides it is ready. Enjoy it guilt free with a cup of tea. Heat the Oil in a kadai or a heavy bottom pan. Do not heat it to very high temperature, let the oil be medium hot. Once hot, add small dollops of the mixture giving it a slight round shape if required using your hand. Let it cook on medium gas. Cooking on medium is necessary or else it becomes soft from inside. Turn and let it cook on the other side too. 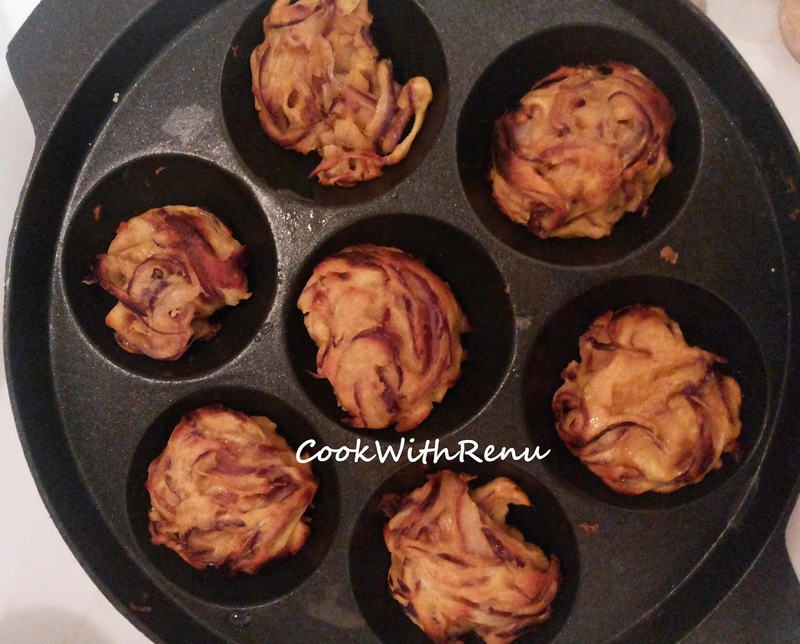 Yummy onion pakoda is ready, serve it with hot tea on a rainy day.